The AR8200 quickly established itself as the ‘top notch’ hand portable receiver providing unsurpassed features. As technology has advanced, so the AR8200 has evolved through the AR8200 MK2 drawing from the successful award winning AR5000 base receiver and more recently from the AR8600 MK2 transportable receiver, resulting in the AR8200 MK3 (with 3GHz coverage). Along with an extended receive frequency coverage, the illumination has been further enhanced and high capacity NiMH batteries supplied. A Temperature Compensated Crystal Oscillator (TCXO) forms the heart of the AR8200 MK3, this ensures high stability with minimal internal spurii... the TCXO replaces a crystal reference as commonly employed in other receivers and is usually only seen in top of the range (more expensive) table-top models such as the AR5000 and AR7030. Performance too has seen the AOR R&D team fine tuning the front end switching circuitry design for best sensitivity and strong signal handling over the extremely wide coverage of 530kHz to 3000MHz (all mode receive without gaps). A telescopic whip aerial on a swivel base is supplied with a small medium wave bar aerial. The illumination of the LCD and keypad is bright and switchable in a number of ways to help conserve battery power for extended operation. This includes the ability to AUTO switch the illumination when the keypad is touched or when a transmission opens the squelch... useful for night time operation. Continuing the strive for even longer operation between charges, the AR8200 MK3 is supplied with 4 x AA size 1500mAhr NiMH (Nickel Metal Hydride) batteries, again reflecting improvements in modern technology. The list of features is vast, large multi-section backlit LCD, side mounted keys and rotary tuning control, alpha-numeric text comments. The all important 8.33 kHz airband channel step is correctly implemented (eight-and-one-third, 33, 66, 00). Channel steps are provided via a menu and may be programmed. Step may be programmed by the operator in any receive mode using multiples of 50 Hz in any mode (i.e. 5 kHz, 12.5 kHz or even 1.25 kHz). Extensive step-adjust and frequency offset facilities are also provided (as per AR5000) to ensure tracking of the most obscure band plans, AFC (Automatic Frequency Control) is included for spot on tuning ensuring that nothing is missed. A wide frequency coverage is available from 530 kHz to 3000 MHz (no gaps) with actual minimum acceptable frequency of 100 kHz. The RF front-end is preselected around VHF to ensure the highest levels of adjacent channel rejection with software spurii cancellation. The short wave bands are converted directly to an IF of 45 MHz to remove compromise and a detachable plug in medium wave bar aerial is provided for localised monitoring with a negative feedback circuit employed. featured. 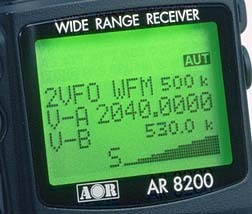 A meaningful band plan is factory programmed specific to market area, this ensures that the AR8200 MK3 automatically selects the correct receive mode and tuning step (although mode and tuning step may be manually selected at any time), the band plan may be edited via computer control. The side keypad provides four arrow keys presented as a single ‘rocker’ resulting in more natural and intuitive navigation through the on-screen menus. Tuning is accomplished via a variety of controls including a side panel indented main tuning dial, arrow keys and keypad. A larger than average back lit LCD with contrast control provides operational data with the ability to add 12 character text comments to each memory channel, memory bank and search bank, a text search feature simplifies identification and recall of stored information. Many text prompts aid operation making programming of search banks etc straight forward. Two frequencies may be displayed along with operating legends and high resolution signal meter and multi-function band scope. The band scope provides adjustable span width from 10 MHz to 100 kHz , you can move the marker, operate peak hold, transfer the marker frequency to VFO and save trace for later recall. The stylish black cabinet has a quality feel with an excellent rear-illuminated keypad with a hard wearing finish. need for a backup battery or capacitor. from the AOR web sites, this provides frequency control & management, searching, scanning, logging with support for geographic data from a GPS and audio recording to disk. This connector also supports clone of data between two AR8200 MK3 along with tape output, detector output and AGC. The AR8200 MK3 is powered from 4 x AA internally fitted high capacity NiMH cells (supplied), dry cells may be used. External power may also be connected to the charge socket for extended periods of operation (9 - 16V d.c.). ‘As if this was not enough’, optional internal SLOT CARDS (which fit into the AR8200 MK3 base) extend the capabilities even further: lMemory slot card (increase storage to 4,000 memories, 160 search banks). lCTCSS slot card squelch & search. lRecord chip slot card (records up to 20 seconds of audio). lTone eliminator slot card, lVoice inverter card. Refer to the OPTIONS PAGE and OPTIONS LEAFLET for further information. x 143(H) x 39(D) mm (excl. projections). Supplied with: NiMH batteries (1500mAhr), charger, cigar lead, swivel base telescopic whip aerial, MW bar, belt hook & screws, strap, comprehensive illustrated operating manual (free PC software is available from the AOR web sites). Specifications subject to change without notice due to continuous development of the receiver. E&OE. performance between 100 kHz to 530 kHz is not guaranteed). generators at 145.200 and 145.300MHz. a little louder but not twice as loud. 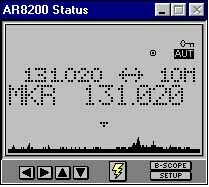 Subjectively speaking, for any specific setting on the Mk3 volume control, the output does sound louder than the same position on the series-2. the Mk3 at the lower frequencies.